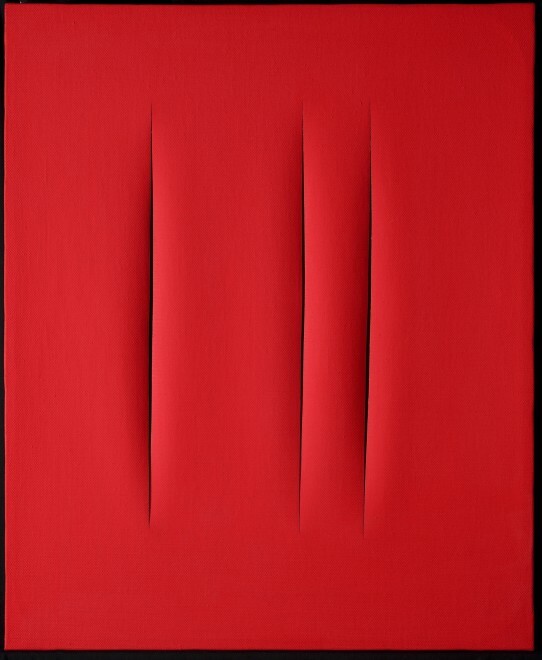 E. Crispolti, Lucio Fontana. Catalogo ragionato di sculture, dipinti, ambientazioni, Milano 2006, vol. II p. 889, n. 68T114. Concetto Spaziale Attese belongs to the last months of Lucio Fontana’s life, which was a time of frenetic activity. In the eight months that span from the beginning of that year to his death on September 7th 1968, Fontana produced around 150 works. In January Fontana left Milan and his studio in Corso Monforte to move to Comabbio, near Varese, where he restored the old family house and set up a new studio; there he chiefly worked on his most iconic production - the tagli, or more correctly the Concetti spaziali. Attese as he christened his canvases pierced by one or more slashes; Enrico Crispolti in the last edition of his catalogue raisonné has listed 143 works of this kind dating to 1968. As usual Lucio Fontana wrote an inscription on the back of the canvas, since he was concerned by the possibility of forgeries and so viewed this as a way to defend both himself and his work from this eventuality. The inscriptions on the back of the early Concetto Spaziale were basically a sequence of numbers, the later ones were comments on a variety of matters that testify to the witty spirit of the artist: a large number of these relate to everyday life, to the weather and to the artist’s passion for good cuisine as shown in 68T40 - Il formaggio Gorgonzola puzza! anche il parmigiano (Gorgonzola cheese stinks! Parmesan too) - or 68T90 - Il grignolino stuzzica l’appetito (Grignolino whets the appetite) - or 68T92 - I pesciolini fritti a capolago erano squisiti (Small fried fishes in Capolago were excellent). The inscription on the back of the present work probably refers to the beloved lake of Comabbio, which Fontana could see from the window of his studio. The artwork described above is subject to changes in availability and price without prior notice. Where applicable ARR will be added.